Modern tools of biology could allow someone to recreate a dangerous virus, such as smallpox, from scratch. Another top danger listed in the report, which was released Tuesday, is making existing bacteria or viruses more dangerous. That could happen, by, say, giving them antibiotic resistance or altering them so that they produce toxins or evade vaccines. And one scenario pondered by the experts is the creation of microbes that would produce harmful biochemicals in humans while living on the skin or in the gut. This possibility, the report notes, "is of high concern because its novelty challenges potential mitigation options." Public health officials might not even recognize that they were witnessing a biological attack if the dangerous material was delivered to victims in such an unusual way. All in all, the committee examined about a dozen different synthetic biology technologies that could be potentially misused. For each, they considered how likely it was to be usable as a weapon, how much expertise or resources would be needed, and how well governments would be able to recognize and manage an attack. "There are certain capabilities that may not be possible now, but in those cases we tried to identify what the bottlenecks or barriers might be that, if overcome, would enable those to be more possible," Imperiale says. One of the least concerning possibilities, because of the knowledge and technical barriers, was inventing a brand new pathogen by taking a "mix and match" approach to combining genetic parts from multiple organisms, according to the report. It notes that making even simple changes to viruses can produce "drastic deficiencies" in key viral properties, "making any such effort especially difficult," and that "the difficulty increases as the distance from natural pathogens increases." But that was exactly the scenario that recently unfolded in a table-top exercise conducted last month by the Johns Hopkins Center for Health Security. During the event, experts in pandemic response and national security grappled with a fictional virus called "Clade X" that was created by a terrorist group that inserted genetic elements of deadly Nipah virus into a normally-mild human parainfluenza virus. The terrorist group in this scenario wanted to depopulate the Earth, and deliberately released the contagious virus at multiple spots around the globe. The resulting pandemic killed 150 million people within a year as officials struggled to contain the social and economic chaos until a vaccine could be made. "What people don't think about very often is the potential for an engineered organism to become an epidemic or even a pandemic. One of the goals of this exercise was to show that an engineered organism could be the cause of something that we are not really preparing for," says Dr. Tom Inglesby, director of the Johns Hopkins center. "What we wanted to show in the exercise was that there are different ways of getting to a pandemic. And we need to be prepared for all of them." Much of the public health response to an engineered outbreak would be the same as to a natural outbreak, the exercise showed. That means a possible line of defense is beefing up public health infrastructure such as disease surveillance. And, as the new report notes, the same synthetic biology tools that could be used to harm could also be used to fight this threat, by allowing the rapid creation of better medicines, vaccines, and diagnostics. Pamela Silver, a synthetic biologist at Harvard who was not on the committee but reviewed its report, said that the assessment is "timely, given that there's a lot of attention being paid to genetic engineering because of CRISPR," the new tool that has made it much easier to edit genes. She does worry, though, that because this report ranked potential threats, "somebody might say 'oh, here are the three things we have to worry about the most,' and then ignore the others." And this assessment was made based on today's technology, she says, but it's clear that biology changes rapidly and is full of surprises. "So what's the next CRISPR? What's the next big thing?" Silver asks. "We need to anticipate, as well. Biology is a rapidly moving field and we need to stay on top of that." She says she just recently was looking at a preprint of a scientific paper about engineering bacteria, "and I noticed that it was from high school students. That's just amazing to me." Scientists are getting better and better at editing and altering genes. Making DNA is getting cheaper and quicker all the time. Now, a group of scientific experts has laid out how these new technologies could lead to new bioweapons. NPR's Nell Greenfieldboyce has the story. NELL GREENFIELDBOYCE, BYLINE: If you were going to imagine a genetically engineered bioweapon, you might dream up something like Clade X.
GREENFIELDBOYCE: That's a fake news report about Clade X, a fictional illness used in a tabletop exercise held last month by the Johns Hopkins Center for Health Security. Experts in national defense and public health pretended to be government officials grappling with what seemed like a fast-moving, naturally occurring pandemic. But then came this bombshell. UNIDENTIFIED PERSON: GNN has just learned a group calling itself A Brighter Dawn, or ABD, is claiming responsibility for the creation and intentional release of the Clade X virus. 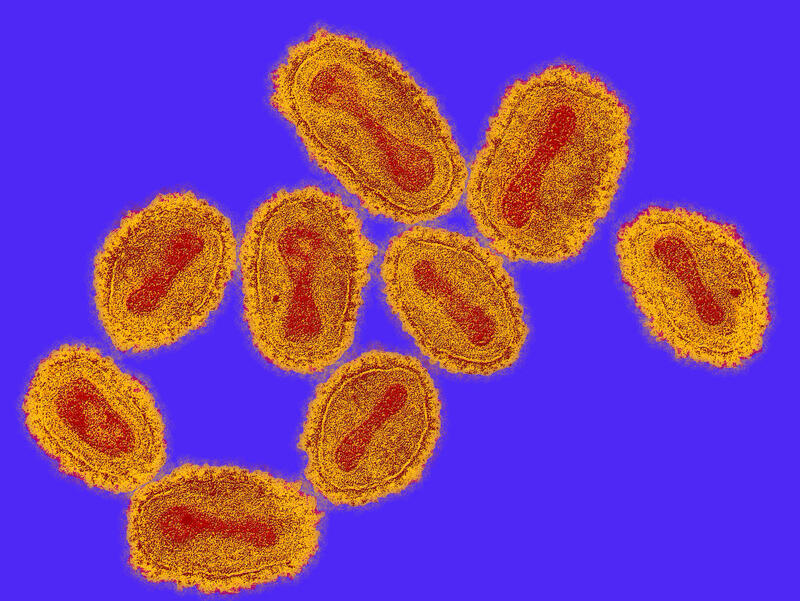 GREENFIELDBOYCE: The goal of this made-up group was to depopulate the Earth, so it put genes from a deadly virus into a more contagious virus. By the end of this fake outbreak, more than 150 million people had died. Tom Inglesby is the director of the center. TOM INGLESBY: One of the goals of this exercise was to show that an engineered organism could be the cause of something that we are not really preparing for. GREENFIELDBOYCE: The Department of Defense has been thinking about new biotechnologies. And at its request, the National Academy of Sciences, Engineering, and Medicine recently convened a panel to consider how these tools could be misused. Its report came out today. Michael Imperiale is a microbiologist at the University of Michigan who chaired the panel. He says they considered a dozen different strategies for making a bioweapon. MICHAEL IMPERIALE: We think the things that are of most concern are, number one, recreating a known virus. GREENFIELDBOYCE: He says pretty much any virus can be made from scratch now, even smallpox, which is held under lock and key. We know that because a related pox virus recently got made in a lab using DNA ordered through the mail. IMPERIALE: These things can now be done. So that's why that was near the top of the list. GREENFIELDBOYCE: Another big concern was making existing bacteria more dangerous with simple tweaks like putting in antibiotic resistance. And then there's the possibility that a weapons maker might target the human microbiome, the bacteria that live in and on us all the time, so that our own microbes would manufacture dangerous chemicals and make us mysteriously sick. Scientists who weren't on the panel say that this is a very timely report. Pamela Silver is a bio engineer at Harvard Medical School. She does worry a little about the idea of ranking the threats. PAMELA SILVER: Somebody might say, oh, here are the three things we have to worry about the most and then ignore the others. GREENFIELDBOYCE: She hopes that won't happen because what's impossible now might soon be much more feasible. SILVER: There are two papers that just came out this week about a different strategy for DNA synthesis that may transform that industry in the next five years. GREENFIELDBOYCE: That's why the report says it's important for the Department of Defense to monitor these changes. It also notes that while biotechnology has risks, it can also be used to speed the development of vaccines and medicines. Nell Greenfieldboyce, NPR News. (SOUNDBITE OF GREYBOY'S "BIG TITO") Transcript provided by NPR, Copyright NPR.